Amy Steffian | Alutiiq Museum Sep 10, 2018. 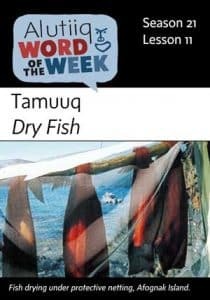 Tamuuq kinertaa.—The fish is dry. Catching salmon is only the first step in a long process of preserving summer’s abundance for winter use. The real work begins once the fish are in the net. In the past, Alutiiq women used slate knifes, known as ulus, to clean and split fish, which they hung by the tail on wooden racks. Historic photos of Alutiiq summer villages show drying racks laden with filets beside sod houses. Fish had to be processed quickly to avoid spoiling and then carefully tended to protect them from bugs, birds, and rain. Fish that were not completely dried would rot, threatening even the most successful fisherman with a hungry winter. In addition to salmon, Alutiiq people dried halibut, cod, and many types of meat. At meals, people dipped strips of dry fish into bowls of sea mammal oil. Dried fish remains a favorite food. Alutiiq families continue to hang red salmon filets and strips of halibut. In good weather, thin pieces of halibut will dehydrate in about ten days. Salmon filets take a number of weeks, but once dry, they can be stored for months. Many people eat dry fish as a snack, dipping it in special homemade sauces. Others carry dried fish when traveling for a quick meal.